« Do People Actually Live In Provincetown? These five homes are as unique as the town itself but do share the best location in the world – the West End of Provincetown. 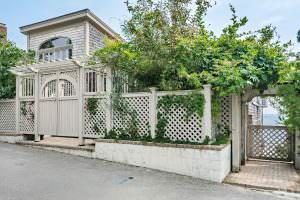 The five properties featured below share the highest sales prices in Provincetown so far this year. Twenty-six single family properties have sold year to date with sale prices ranging from $560,000 to $3,600,000. Sixteen of these sold had sales prices above $1M. There are currently 32 singe family properties for sale with asking prices ranging from $599,000 to $6,450,000. 52 Point Street is a exceptional home with three bedrooms and 4 baths and 3,212 square feet. It was marketed for $2.895M and sold for $2.75M. Point Street has become its own exceptional little neighborhood just in the last five years. This home is one of the western anchors on the street. 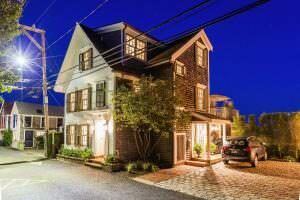 MLS REMARKS: Located on one of the West End’s most coveted dead-end streets, this 3,300 square foot home has everything you will ever need to enjoy your time in Provincetown. Whether you are looking for the perfect summer retreat or a place to call home for every season, 52 Point Street offers it all. 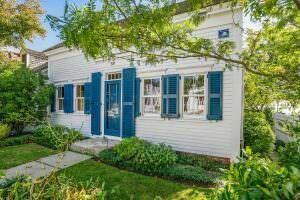 Tucked away from the hustle and bustle, you’ll find this Greek Revival three story home at the end of a picturesque cobblestone driveway lined with mature plantings. Park your car in the heated two car garage before taking a walk through one of the most beautiful gardens in town. This unique home was completely renovated by the current owners in 2015 and includes three large bedrooms, three and half baths, two outdoor showers, two laundry rooms, surround sound throughout, and multiple gardens. MLS Remarks: Welcome to 21 Commercial Street, a unique and elegant bayfront property located in Provincetown’s historic West End. A wall of windows invites the ever-changing views of Provincetown Harbor into this distinctive contemporary 4-bedroom, 3 bath home. The multi-level layout features an open floor plan which offers sweeping views from every level. Kitchen with white bead board cabinetry, marble and granite countertops, stainless steel appliances and a walk-in pantry. All the baths are tiled—The master suite includes a luxurious deep soaking tub for two and a heated towel bar. Many interesting architectural details include exposed brick and multiple built-ins, including a custom cedar closet in the master bedroom and a hidden wet bar for entertaining. 59 Commercial Street is comprised of two houses, one on Commercial Street and one directly on the water. There are three total bedrooms and five baths and a total of 2,364 square feet in the two buildings. This is an exceptional waterfront property in the heart of the West End. It was being marketed for $3.490M and sold for . $3.2M. MLS Remarks: You’ll find this exquisite compound consisting of 2 year round homes in the West End, directly on the bayfront. The 1468 s.f. main house was floated over from Long Point and has been totally renovated with details respectful of the period but with all the modern amenities. The 2BD/2.5BA house has wood flooring throughout, a gourmet kitchen, and 2 wood-burning fireplaces. The 984 s.f., 1BD/1.5BA cottage sits directly on the water with lovely views of Provincetown Harbor and Long Point. Separate utilities, split A/C, wood floors, full kitchen, 2 decks. The beautifully landscaped yard has irrigation, parking for 2-3 cars, and bluestone patios. Hooked up to the municipal sewer system. 73 Commercial Street is a one of a kind waterfront home in the West End. It is a three bedroom four bathroom home with 2,426 square feet. It sold for $3.260M and had an original list price of $3.499M. MLS REMARKS: Spend your summer on the Provincetown West End waterfront overlooking historic Captain Jack’s Wharf, with magnificent views of the harbor out to the tip of Cape Cod, Long Point Light House. This 2015 renovated antique has all the amenities and quality finishes awaiting you, your friends and family.Three large bedrooms with en suite baths on three separate floors: each with waterfront decks for entertaining. A total of 2426 square feet of living space sits on a 5358 square foot lot.Property includes generous water frontage and direct access to the beach.Love boating? Moor your boat right out front; plus plenty of room to store all your water toys.From the chef’s stainless steel kitchen with Sub Zero refrigerator, full size Liebherr wine fridge (300 bottles) and Bertazzoni range; to the walled decorative gas fireplace in the dining area; to the exquisite expansive 1st fl outdoor entertaining deck and professionally landscaped yard. 6 Telegraph Hill is one of the eight homes on Telegraph Hill. With three bedrooms, six baths and and 5,508 square feet, and wonderful outside spaces – this home just might be the best on the Hill. We were fortunate to have participated in the buyer side of this sale. MLS REMARKS: Capture the amazing water and town views from the moment you enter this exceptional home atop Provincetown’s Telegraph Hill. The main level with 3 fireplaces, dining room, butler’s pantry, eat-in kitchen, den, and large living room offers panoramic views from room to room and fine finishes throughout. The kitchen is a Chef’s delight – linen white Wood-Mode cabinets, center island w/ Carrara marble, built in Subzero, 2 dishwashers and 6 burner Wolf stove. On the 2nd level a superb master suite awaits with a private living area, a spacious well-appointed bath and bedroom with fireplace and views of the waterways, rooftops and iconic Monument. There are 2 guestrooms with en suite baths and water views from east to west. The home’s garden level provides an additional living area with full bath, bath, 2 car heated garage, and a dumbwaiter. The wraparound porch, 3 slate patios, and heated infinity pool provide vantage points to enjoy the unmatched views and beautifully landscaped grounds.